This is an ultimate audio product, one for those looking to open up the sound of an already top-notch system. They will improve any system, however, but the cost is a deciding factor and they perform better under big speakers. First he did it with air, now it's springs, so just what is Max Townshend up to this time? Actually, he's continuing the good work of decoupling, that has been at the heart of his products since the Rock turntable hit the scene with its vibration-damping trough of silicone. The latest idea, is a spring suspension system that can be adjusted for loudspeakers of, more or less, any shape or size. This is the third incarnation of the Seismic speaker stand, the first was a flat platform with a pneumatic isolator that worked well, but lost air over time with heavy speakers. This was followed by a sprung system with one cradle per speaker of a fixed width, which made it difficult for Townshend to have a stand for all speakers in stock at any given time. 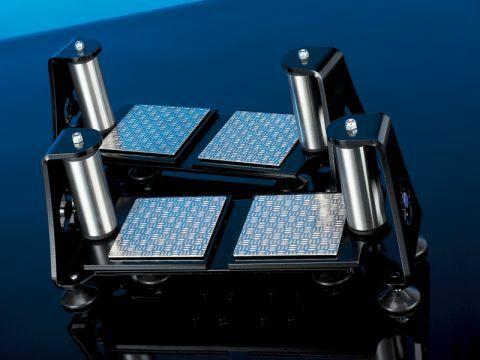 The Seismic Cradle, however, can be supplied with a variety of alternative crosspieces to suit all manner of loudspeakers. Working in pairs, the cradle suspends the speaker on a spring in each cylindrical post. These springs can be adjusted for tension, with a nut atop each one so that a range of weights can be accommodated. You also need to specify the speaker weight, so that the spring is not too weak or too strong. This is important in allowing the speaker to be properly decoupled from the floor. Why decouple a speaker in the first place? Because when it's standing on the floor (and more than likely spiked in position) it will dissipate a lot of its energy downwards, transmitting vibration back to both the source and the amplification, which seriously undermines performance. It also resonates the floor to such an extent, that the sound can be more easily heard by your long-suffering neighbours. We tested the cradles under Bowers & Wilkins' 802D speakers, the latter's 80kg weight putting them right at the limit of this particular cradle. Once you have adjusted the width, it's just a matter of placing them under the front and rear speakers and then adjusting the springs to compensate. You can put speaker stands on the cradles, but would probably be better off using Townshend's suspended stands. The reward for the efforts, is a significant increase in openness, realism and presence that is most apparent with voices. Imaging is also greatly improved with a degree of holographic realism being added to the better recordings. The high price of a set of Seismic Cradles dictates their exclusive use with high-end speakers and systems. But for those who already have everything else in place, then they free up a system to fulfil its potential (as well as keeping the neighbours happy) which can't be a bad deal.